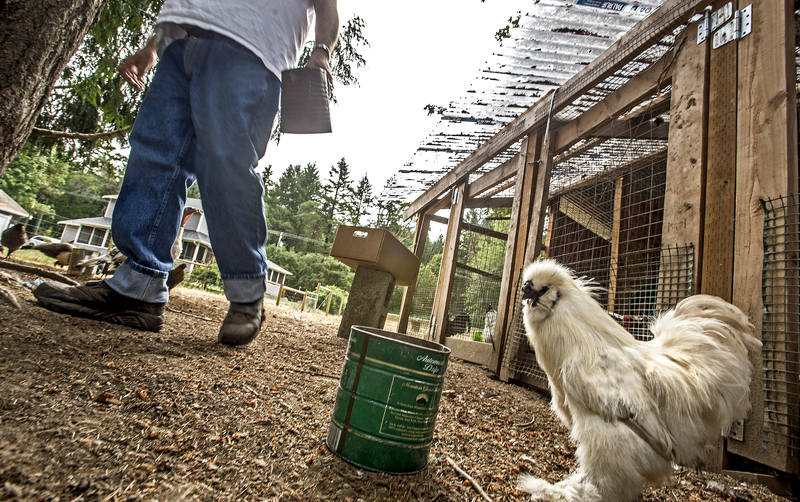 Barbara and Marvin Rowland own a 20-acre property they call Sunny Key Farm on the Key Peninsula where they have dozens of animals, including chickens, peafowl, goats, a pony, dogs and cats. The Rowlands have had to contend with raising spare chickens simply left at their farm. Funny how stories are found and told. A few days ago I came across one of the funniest (to me anyway) posts I had ever seen as I was scrolling through the Key Peninsula Washington Facebook feed. “O.K. o.k…..#@!#$%^&*%$#@!!!!!!! YOU did it to me again. Last year you dumped 5 game roosters off in the barn pasture. Today you did it in my front yard. The big golden rooster you also dumped didn’t survive the eagle attack last summer. I will usually take peoples extra roosters. Most I am able to sell. Game roosters I can’t. Now these mini hoodlums are tearing up everything. I am going to have to catch them….and….eat them,” wrote Barbara Rowland of Sunny Key Farm. I grew up with chickens in my father’s farm in the Philippines. I know a little about the birds. The line about “mini hoodlums” left me in stitches. Next thing I know, I am sharing with fellow editors Rowland’s plea at a gathering of newshounds from The News Tribune at the Swiss in Tacoma. That left them in stitches. We all agreed this would make a wonderful story for our columnist Larry LaRue. 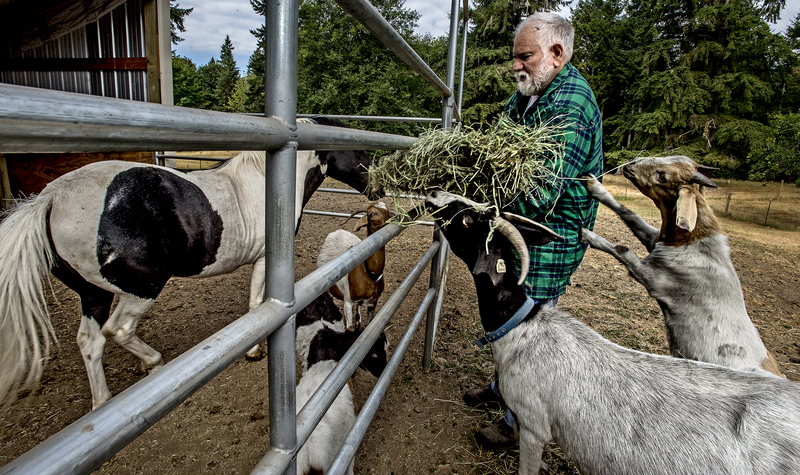 Marvin Rowland brings the goats and pony a treat at morning feeding at Sunny Key Farm. 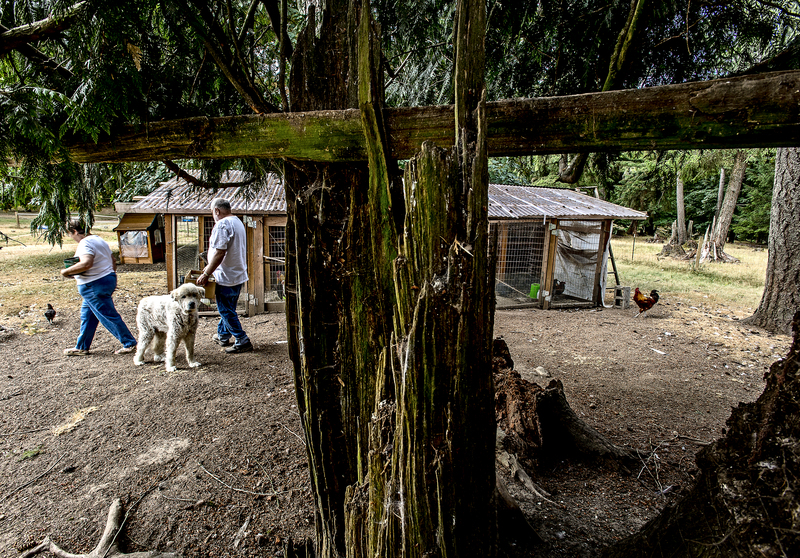 LARRY LaRUE: Life anything but quiet on this farm. MORE PHOTOS: A gallery of images from Sunny Key Farm. WATCH A VIDEO: Hear Barbara Rowland’s farm at feeding time.